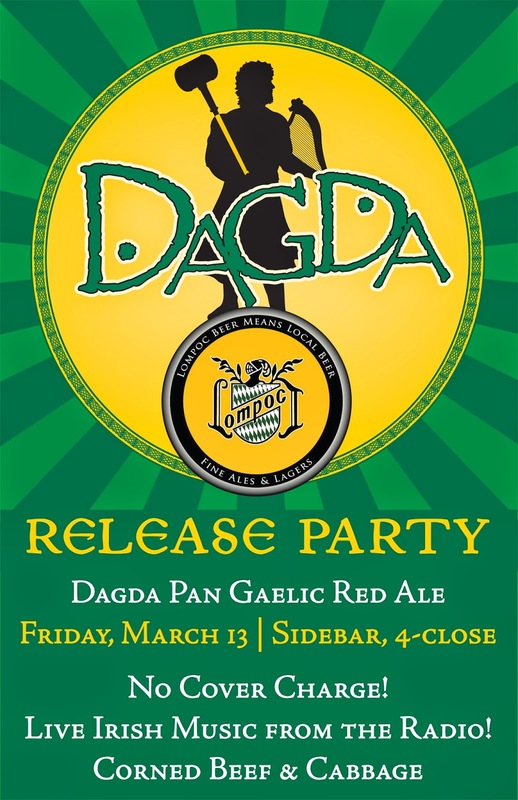 Kick off St Patrick’s Day early at Lompoc Sidebar (3901 N Williams Ave) on Friday, March 13 from 4pm to close with the release of Lompoc Brewing's Dagda Pan Gaelic Red Ale. Join the Lompoc brewers for an Irish celebration including corned beef & cabbage, real live Irish music (from the radio) and pints of specialty ales. Dagda features a rich, malty body and underlying hoppiness. The brewers employed a small portion of black malt and a four-hour boil to give the beer its ruddy red color and sturdy body. Dagda is named after named after the “good god” of the Celts who was in important figure in Irish mythology. Tales depict the Dagda as a figure of immense power, armed with a magic club and associated with a cauldron. The club was supposed to be able to kill nine men with one blow; but with the handle he could return the slain to life. The cauldron was known as the Undry and was said to be bottomless, from which no man left unsatisfied. He also possessed Daurdabla, a richly ornamented magic harp made of oak which, when the Dagda played it, put the seasons in their correct order; other accounts tell of it being used to command the order of battle. Sidebar is Lompoc Brewing’s barrel tasting room and bottleshop and offers a dozen taps – including one reserved for cider – featuring a number of the brewery's barrel aged and seasonal specialty beers. It also offers a full bar and food menu.